Lying on the floor was a visibly pregnant woman. She was screaming in anguish and clasping her hands to her face. Two trails of blood leaked through her hands, forming a dark pool on the concrete floor. Around her in different states of utter shock were her five young daughters, the eldest barely a teenager. The shard of glass was the last thing she had seen, and the last she would ever see. The wailing woman on the floor was 39-year-old Piah Njoki. She and her husband, 42-year-old Jackson Kagwai, owned the shop that was now a crime scene. 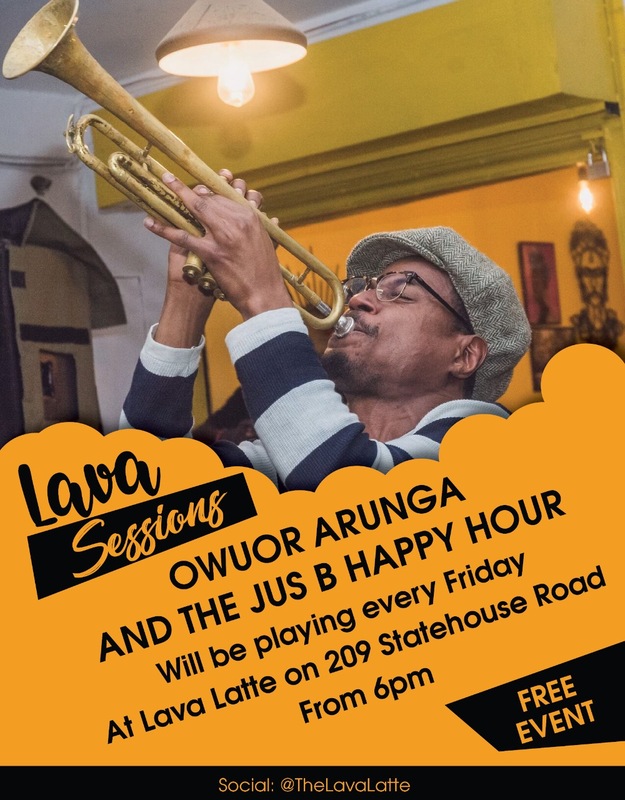 To their neighbours, the screaming was not uncommon as Kagwai would occasionally get drunk and batter his wife. Today, however, the cries for help had gone a notch higher, with the clear sounds of distress and utter pain. Her husband had demanded to know whether she would finally bear him a son since all their five children were girls. In a fit of drunken psychopathic rage, Kagwai pinned Njoki to the ground by sitting on her, all the while as their girls begged him to stop. He then broke a bottle and ruthlessly used the sharpest shard he could find to gouge out her eyes, blinding her forever. Njoki and Kagwai were married on August 16, 1969 at the Baricho Catholic Church. In the next fifteen years, the couple bore five children, all girls. In 1983, Njoki, a primary schoolteacher, was pregnant with their sixth child. To most people who knew him before that dark morning of November 4th, Kagwai was a polite, ambitious man. On that night, however, he turned into a savage and ruined the life of the woman who had dedicated her life to him. Kagwai tried to silence the people around Njoki from reporting his brutal assault on her but the story refused to die down. He was eventually arrested and charged with causing bodily harm. Njoki’s case was mentioned by the Kenya delegation at the 1985 World Conference on Women in Nairobi. That was the same year when the International Federation of Women Lawyers-Kenya Section [FIDA (K)] was established in 1985. FIDA took up Njoki’s case and provided her with the kind of legal assistance she needed to finally get some justice. In 1986, Kagwai was found guilty of harming Njoki by permanently blinding her. News reports from the time mention two accomplices in the assault, Kagwai’s girlfriend and his younger brother. There is seemingly no record of whether they were ever charged with their role in the crime. An odd thing happened during Kagwai’s sentencing for his heinous crime. When Piah Njoki was led to the stand, she pleaded with the judge to release her brutal husband because her children still needed a breadwinner. To the dismay of activists who had pushed for justice, Njoki made a case for a light or suspended sentence for her assailant. Kagwai was, however, sentenced to seven years imprisonment. Njoki then filed a civil suit against her husband. The case, High Court of Kenya Civil Case No. 3897 of 1986, became one of the most high-profile divorce matters of the decade. It was clear the battery had gone on for years but the schoolteacher had persevered through it all for her children. Kagwai, a former banker who was now a bar owner and a farmer, was the primary breadwinner in the family. Njoki’s only source of income was her teacher’s salary, one she could now not earn because she couldn’t resume her position at Kirinyaga Primary School. To the court, it was clear that Kagwai had not only planned the attack, he had also caused irreparable damage to Njoki’s eyes and life. 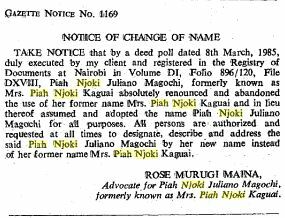 In March 1988, the High Court awarded Njoki, now called Piah Njoki Juliano Magochi, damages worth KShs. 900, 000. After he was released in 1993, Kagwai tried to get his wife back. He used his sisters, assistant chief and other emissaries but Njoki’s family adamantly refused to let them meet or even consider reconciling. He went back to farming his 1000-tree coffee farm. In a later interview, he claimed the unforgivable reason for his savagery had been her running away from home to live in Kutus. Piah Njoki died on November 8th, 2009 from diabetes complications. In the last 25 years of her life, she had adapted to a new life as a visually-impaired person. She had taken it with a stride, going back to school to learn Braille so she could teach again. She brought up her six children with the help of her parents. One of the girls died but the other five grew up into budding young women who are now all married. The brutal attack on Njoki shocked the world and laid the foundation for the emergence FIDA-Kenya as the foremost defender of women’s rights as it pursued justice for her.